TRENTON, N.J. (CNS) — Dawn Teresa Parkot does not mince words when she speaks about the Aid in Dying bill. The bill, A.1504/S.1072, passed the Assembly 41-33 and the Senate 21-16 and is currently awaiting Democratic Gov. Phil Murphy’s signature. State residents are being urged to contact the governor and ask him not to sign the bill into law. Under the legislation, which goes against the Catholic Church’s fundamental teaching on the sanctity of all human life, adults who receive a terminal diagnosis would be allowed to obtain self-administered medication to end their lives. Advocates argue physician-assisted suicide gives the terminally ill a “death with dignity.” Opponents cite unforeseen consequences, including abuse of power when it comes to those with disabilities; the message it sends to young people and those struggling with depression, and the ability of insurance companies to deny life-saving medications in exchange for those that would take a life. Trenton Bishop David M. O’Connell has been a vocal opponent, sending a letter Feb. 11 to all state legislators representing the diocese’s four counties. Addressing lawmakers, Democratic Assemblyman John Burzichelli, primary sponsor of the bill in the Assembly, said the legislation only affects those wanting to take part in physician-assisted suicide. For those opposed, “nothing changes for you,” he said. “That’s not true,” murmured Fleming, sitting with other pro-life advocates in the Assembly’s balcony. The bill, he said, could require all physicians to refer patients who wanted to end their lives to such a doctor, meaning all physicians would need to act as facilitators. “The physician knows what the intention of the second physician will be — to prescribe the (life-ending) medicine — which is tantamount to doing it oneself. So it is, in effect, asking those opposed to participate in physician-assisted suicide,” he said. Parkot, a University of Notre Dame graduate and the founder of the Climb Organization, which educates the public on life issues with regard to the disabled, worries the bill will allow for abuse of those with disabilities, especially when one’s life is entirely in the hands of a caregiver. The Catholic Church in New Jersey has been part of a broad coalition of groups, including medical professionals, patient rights and disabilities advocates, family and pro-life organizations, veterans and other faith-based groups, “who are dedicated to defeating the legalization of assisted suicide,” according to Jennifer A. Ruggiero, secretary of the Metuchen Diocese’s Secretariat for Family and Pastoral Life. 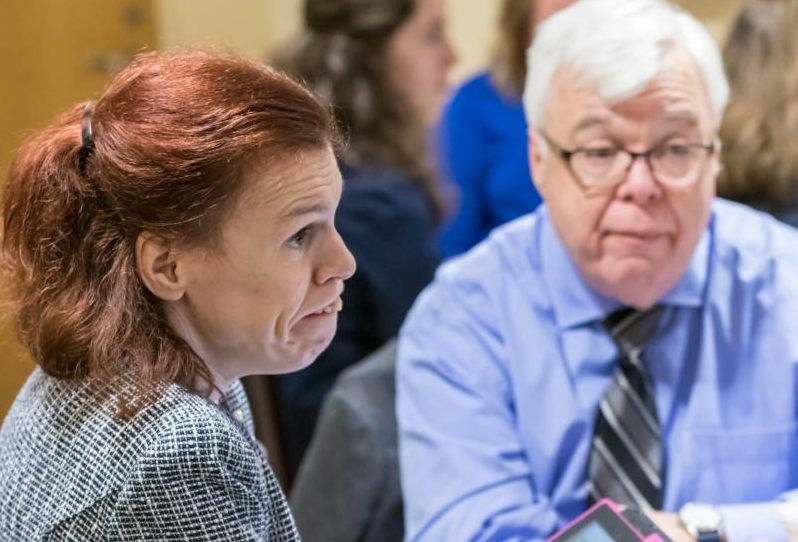 Those put at “grave risk” by assisted suicide, she said, are the state’s most vulnerable populations — those with disabilities, the elderly, veterans and those battling prescription drug addiction. Mauro is managing editor of The Monitor, newspaper of the Diocese of Trenton.